In this treated case we see the profile change after 18 months of orthodontic treatment. More specifically in point (A) the position of the lower teeth changed revealing a well-formed lower lip and more prominent chin. The nose is less noticeable since the upper lip raised and became thicker(Γ). 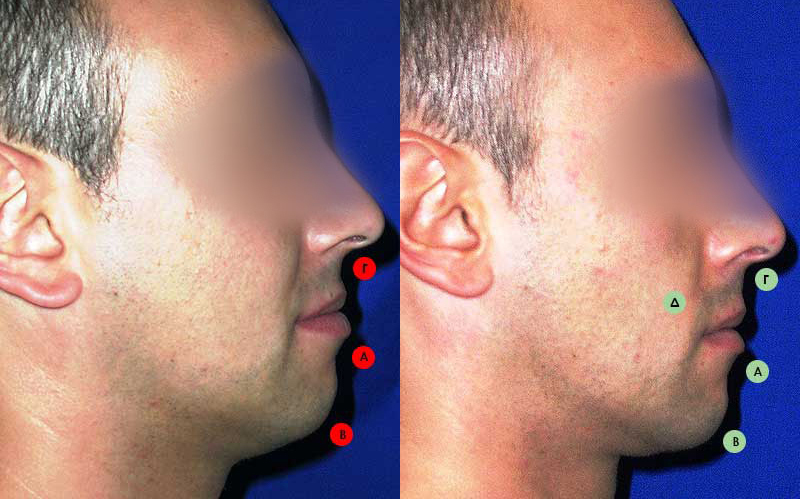 The lower lip and the chin came forward (B) making the profile straight. The nasolabial fold in the base of the nose, the zygomas and the corners of the mouth became smoother giving a younger look. Without an invasive procedure the patient achieved the maximum harmonic and aesthetic potential of her face looking younger. This patient had orthodontic treatment that lasted 20 months. 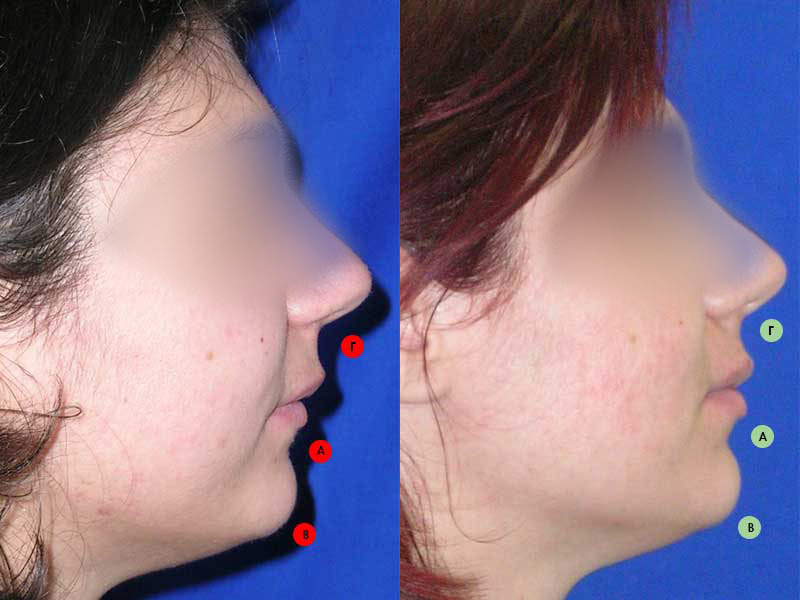 After treatment her profile is straight since the chin came forward (B) and the lower lip is less curved. The upper lip is raised (Γ) showing a better and a more expressive outline. The labiomandibular fold in the lower lip(A) became smoother giving a symmetrical relation of the lips, chin and the nose. This patient had a prognathism of the lower jaw. After 24 months of invisible orthodontic treatment his lower lip(A) is not anymore prominent than his upper lip. 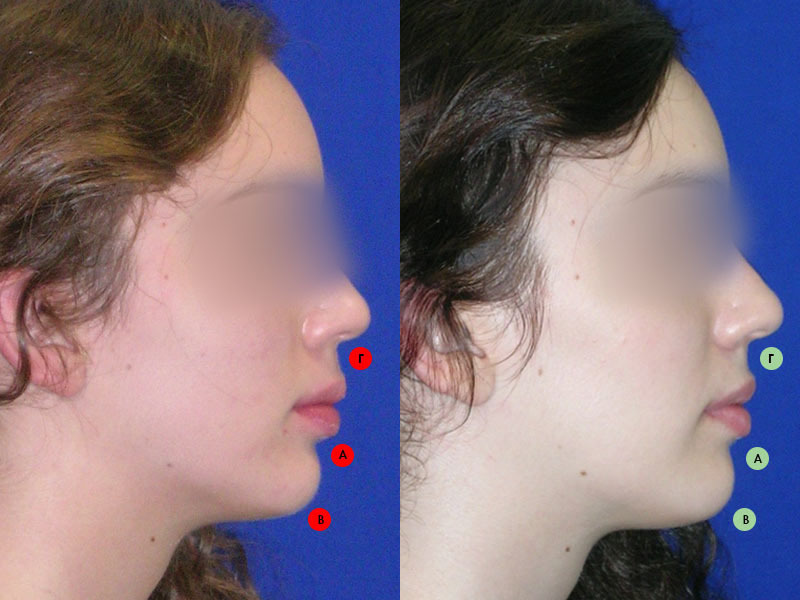 The upper lip(Γ) came forward for a straighter profile. In the nasolabial folds (Δ) we see more fullness of the corner of the mouth since the upper teeth have moved forward. The chin is not sticking out anymore and the patient looks younger.